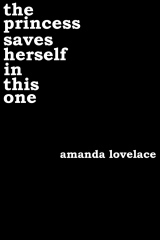 growing up a word-devourer & avid fairy tale lover, it was only natural that amanda lovelace began writing books of her own, & so she did. when she isn't reading or writing, she can be found waiting for pumpkin spice coffee to come back into season & binge-watching gilmore girls. (before you ask: team jess all the way). the lifelong poetess & storyteller currently lives in new jersey with her fianc, their moody cat, & a combined book collection so large it will soon need its own home. she has her B.A. in english literature with a minor in sociology. the princess saves herself in this one is her debut poetry collection & the first book in the women are some kind of magic series. the second book in the series, the witch doesn't burn in this one, will be published in 2018.